Professional sunbeds come in different shapes and sizes. There are two main categories: horizontal, lay-down sunbeds and vertical stand-up units. Both have their advantages, based on your personal preferences and tanning goals. Most professional salons segment their sunbeds into levels, based on tanning power, amenities and other factors. These units fulfill varying roles in the tanning process most effectively, and can be used in combination for optimal tanning results. 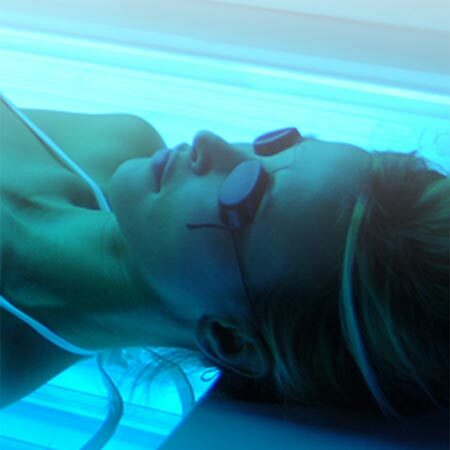 Various additional sunbed features and amenities that can improve tanning and comfort include mix of UVA and UVB, facial lamps, reflectors, sound systems, body mist and more. Sunbeds, like outdoor sunlight, emits UVA (ultraviolet A) and UVB (ultraviolet B) light. Of the UV light emitted by the sun at noon in the summer in Canada: 95 percent is UVA and 5 percent is UVB. More than 90 percent of professional indoor tanning units emit about 95 percent UVA and 5 percent UVB in regulated dosages similar to summer sun. UV light is the same whether artificially produced or from the sun. A UV tan is a natural protection from overexposure. The only difference is the intensity and controlled environment of a sunbed. Recommended exposure schedules developed by the manufacturer under the guidance of Health Canada allow trained sunbed operators to set incremental exposure times, based on the “skin type” of a patron, that deliver consistent non-burning dosages of UV light to allow a tanner to gradually build a tan. While tanning units may be 2-3 times as intense as summer sun, the duration of exposure is controlled, and thus the total UV output is controlled, to minimize the risk of sunburn. A typical indoor tanning exposure schedule (below) for a 20 minute maximum piece of equipment allows a professional sunbed operator to gradually increase the exposure times of a sunbather over the course of the sunbather’s regimen based on the individual’s skin type.